Accordion music suffused with the murmur of men conversing grows stronger as I approach the white linen tent on the common. Red, white and blue adorn the tent. The sign over the entrance declares “Hotel Zouave”. Four muskets lean up against each other in front of the tent, bayonet tips meeting at the top, standing guard before the entrance like some geometrical creature from a Tim Burton animated movie. 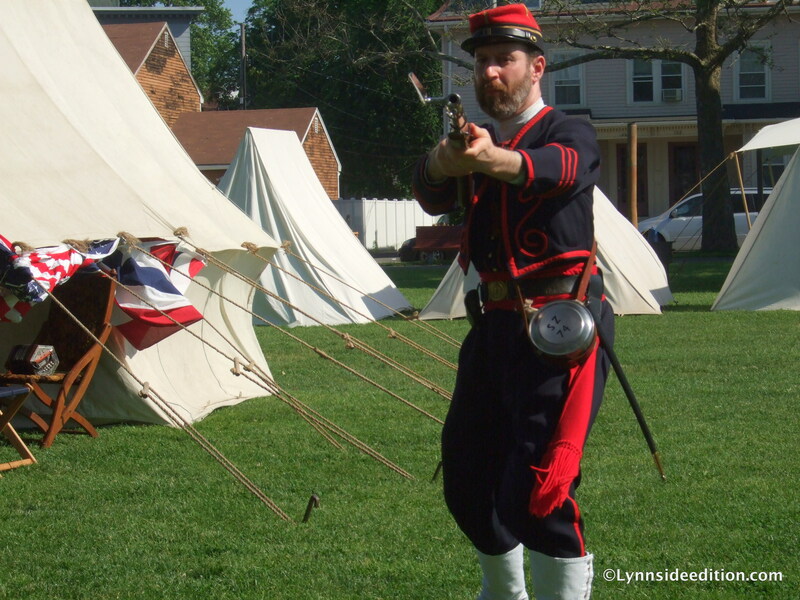 Suddenly 4 men in blue with red-trim uniforms emerge from the tent and each take a musket, remove the bayonet, and check the firing mechanisms. These are members of the Company J of the 8th Massachusetts Volunteer Militia, otherwise known as the Salem Zouaves. In the 1860s, many volunteer militias in the Union and Confederacy adopted the dress and drill routines of a French Algerian infantry unit known as the Zouaves. 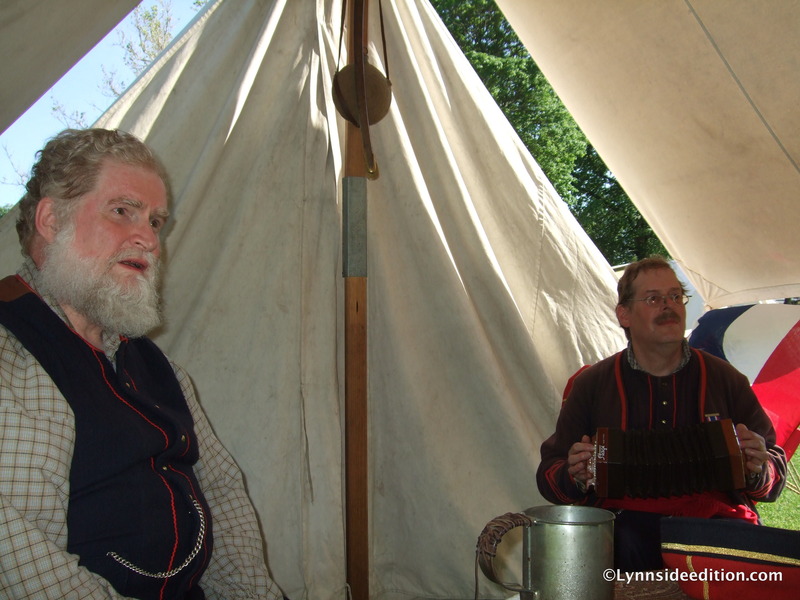 The Zouaves were all the rage back then, widely admired for their courage and prowess in battle, according to the Salem Zouaves’s co-founder, Paul Kenworthy of Saugus, who started the group in 2000. Each one takes the bayonet out of its sheath and places it with a click on the tip of their musket. They then spread out and assume various attack postures. Mark Millman of Arlington has been with the Zouaves for 12 years and points his bayonet menacingly at me in one of the moves. After the drill, I go into the tent. The men welcome me into their conversation. 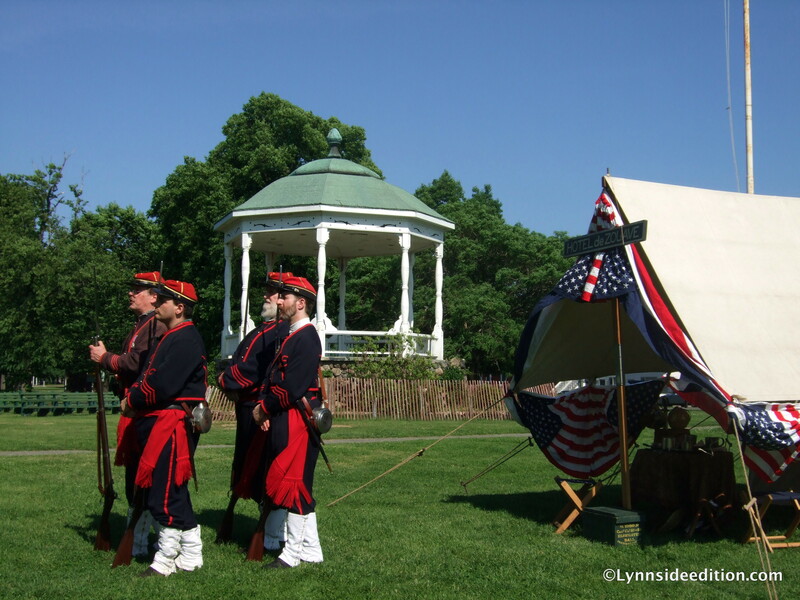 Later, Abraham Lincoln appears at the tent opening, thanks the soldiers for their service to country and discusses how the war is going.